I gave this talk back at the Speculative Futures meet-up in London and it was super interesting. I’ve been teaching and on/off practicing some form of speculative design for years and have settled into an understanding of its limitations. I believe it is an useful research tool, but like any tool it can be used to help and maintain or to exploit and destroy. I’m always a bit vexed by the messiah-like reverence it can be treated with especially by the recent breathlessness it's being dragged up with in UX and design thinking circles. So when I was asked to talk about it at a meet-up aimed at sharing it amongst young professionals I decided to try and articulate some of my concerns about the overstepping of these limitations. As a caveat, the audience were really great and very engaged in a discussion we had at the end with myself and the other presenter, J-Paul Neeley who was a bit more upbeat but equally wary. Also as another caveat, this talk is riddled with generalisations and broadsides which further confirm my unsubstantive polemical approach towards serious, nuanced discourse. As another caveat, the audience were amazing the organisers perfect and J-Paul was a goddamn powerhouse of changing my mind, I hope he publishes his talk too. 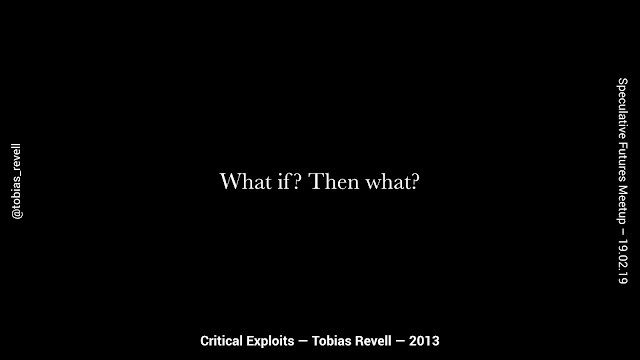 In around 2013 I asked ‘What if? 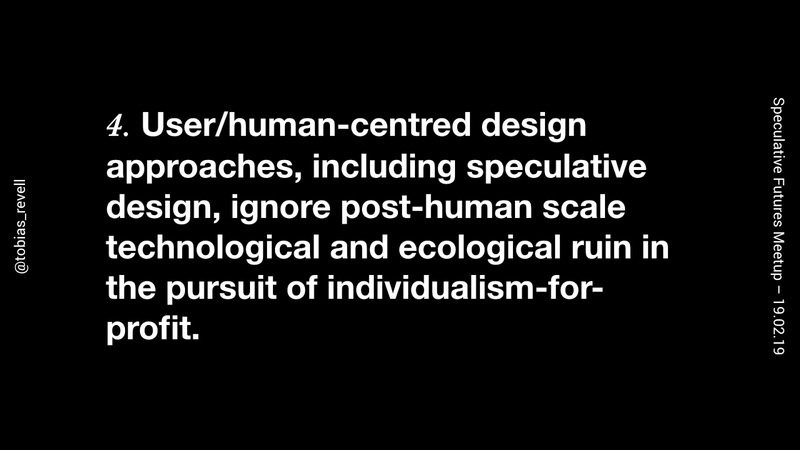 Then what?’ I had been through Design Interactions at the Royal College of Art a few years previously but was seeing the difficulty of speculative design moving beyond the academy or the gallery. It seemed that here was a useful technique but it was struggling to translate provocation to meaningful change. 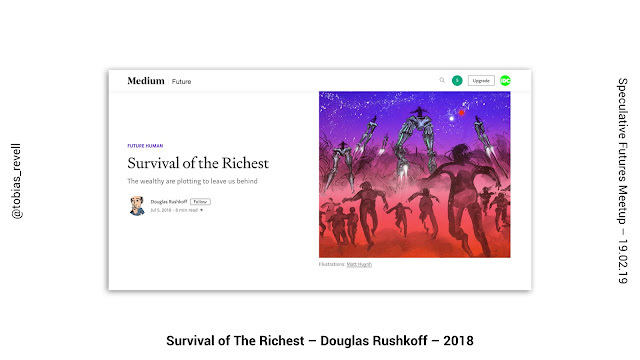 I was practicing and studying in the aftermath of the 2008 financial crisis when that particular world of design was seized by the opportunity that the seemingly inevitable collapse of capitalism presented. 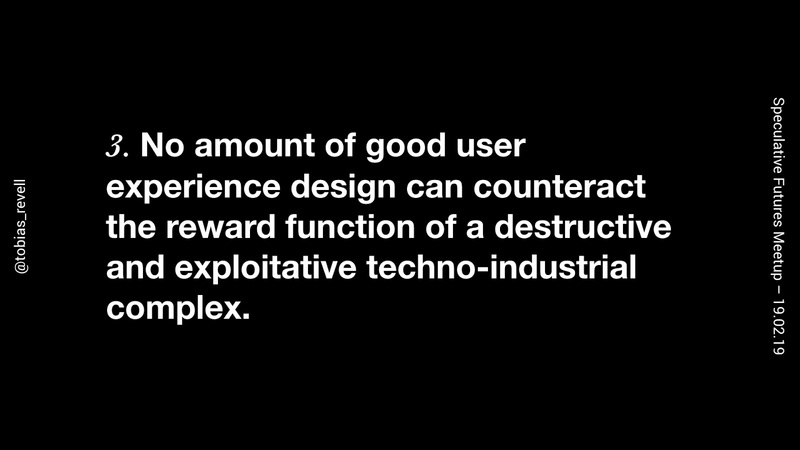 However, the last few years have seen speculative design proliferate in a different way, as part of the mainstream of the business of design - as service to profit and narrow definitions of 'good' and consequently reinforcing the very thing it was conceived of to critique. I’m going to deliver my worries about this trend in the form of five conceits or provocations that sort of flow off one another. They could probably use more thought tbh. Speculative design traces its origins to critical design and the broad corpus of critical practice across the social sciences, art and architecture. 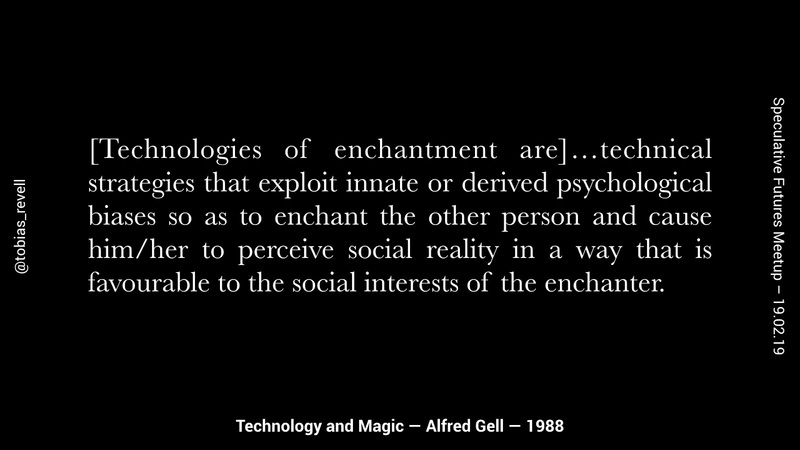 For me this critical practice elicits an antagonistic confrontation with social exploitation, irresponsibility or complacency in the same way as a good artwork, film or song might. This corpus can most easily be traced to the often-referenced radical movements of the late 1960’s who provided an anathema to the central-planning modernism of most mainstream practice. 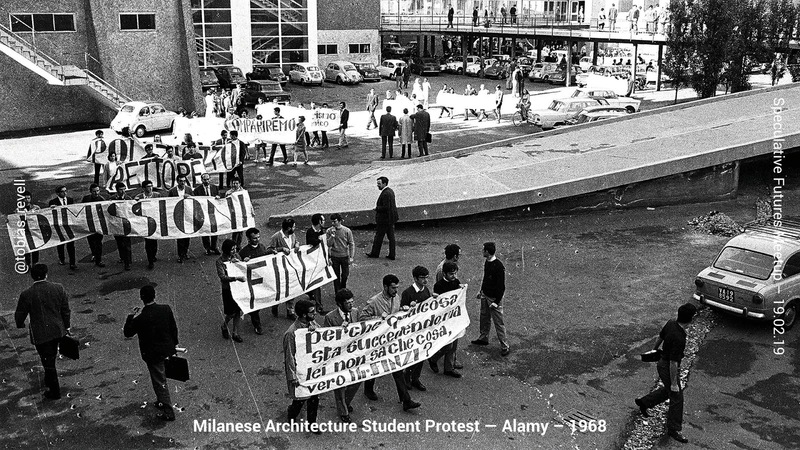 It's fair to say that the range of projects which have connected more meaningfully and tangibly with publics and policy is greater than in the mid-20th century. There are some great projects that have had distinct effect on policy and informed public discourse. Unfortunately, in doing so, another problem in the speculative design thesis is brought to light. What I mean here is that speculative design if often used for either dystopia generation or as ways of reinforcing, or, at best, mildly incrementing on current social conditions. 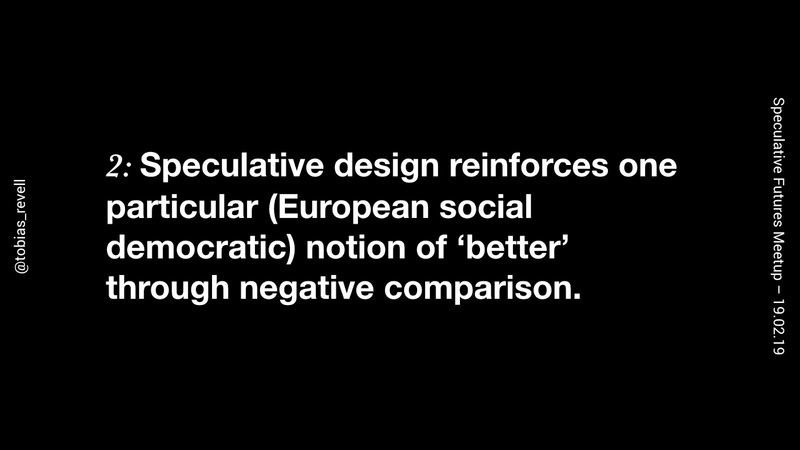 There appears to be an unquestioned subtext that the European social democratic notion of 'progress' is preferable and speculative designs are cautionary tales about straying from this path rather than genuinely exploring alternatives. 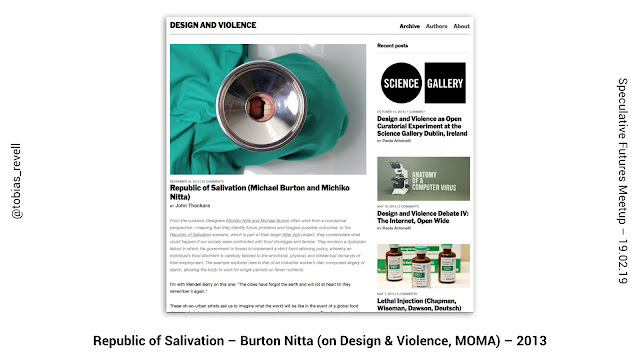 This has been better explored in a range of places most notably in the comments attached to Burton Nitta’s Republic of Salivation project on Design and Violence. Here, commentators pointed out the unquestioned political positioning of privilege when designers could work on projects about speculating on starvation while actual starvation was happening and as a seeming glamorisation and cautionary tale about change. A kind of speculative disaster tourism. 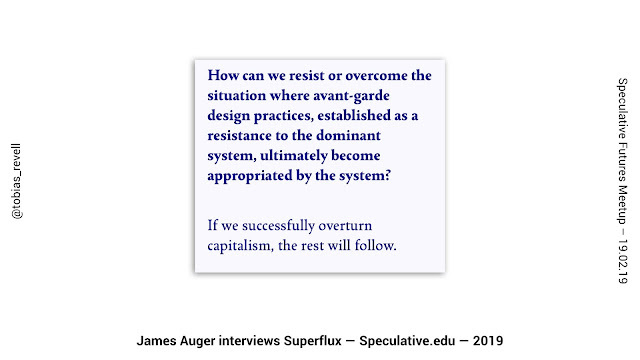 Questioning the politics of speculative design as a practice or method is useful because it acknowledges that at least it is a field that has a politics or acknowledges that designers are political actors, which other fields of design are often reluctant to do for fear of becoming activist. 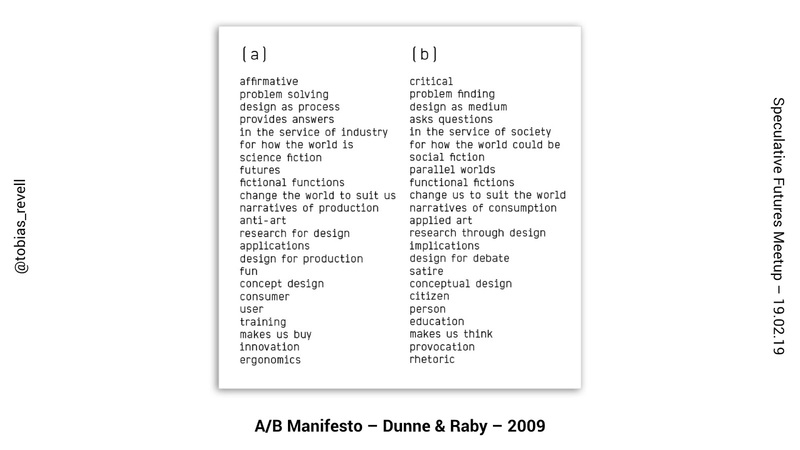 Here in Dunne and Raby’s A/B Manifesto we can use the right-hand column to interpret principles of critical (and speculative, if you like) design but what’s more important is the act of comparison itself; the idea that there is a position to be taken when practicing design that needs to be acknowledged. This is something that mainstream design is often reluctant to do. The manifesto also suggests a questioning of what design is for, what the values of ‘good’ or ‘better’ are when we use these tools for ‘improvement.’ Is ‘better’ more profit? More engagement? More experience? Or is ‘better’ less engagement? Would it actually be better for a person to engage less with your service – to stream less music, to watch less television, to access less information? 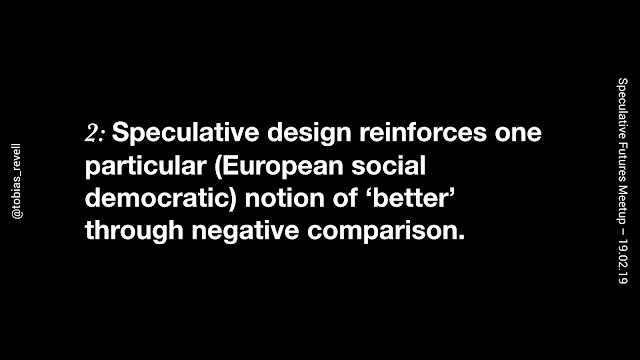 When using speculative design to ‘improve’ services or products the implicit belief is usually that ‘better’ is equivalent to ‘more.’ Consequently speculative design simply serves to reinforce existing design tendencies rather than question them. Puling away form the individual design of a product or service its worth questioning how speculative design, as a subset of human-centred design or user experience is most often geared toward the interface of the individual and the organisation – the products and devices that people use rather than the systemic inequalities that inform these designs. 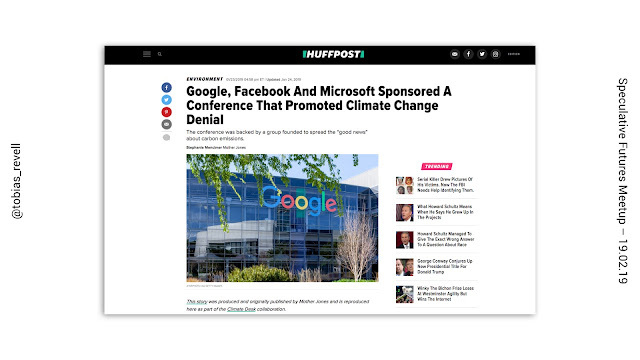 For example, Google and Microsoft in particular produce a good range of speculative design but also fund climate change denial. Design thinkers can cash in all the post-it notes they can get their hands on in an effort to ‘improve’ the products or ‘better’ the user experience but the market imperative of these companies is to maintain a status quo reliant on the exploitation of fossil fuels. Good speculative design in this context would be antagonising these systemic problems rather than targeting the user, which I’ll return to later. Speculative design in the mainstream has largely retreated form these larger questions, not entirely of its own fault; Microsoft and Google would be reluctant to pay the invoices of designers telling them they are destroying the planet. 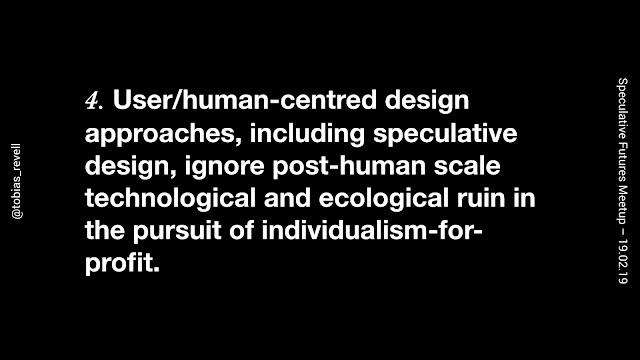 This is a problem beyond speculative design perhaps and more a problem of design per se, in particular that of human-centred design. 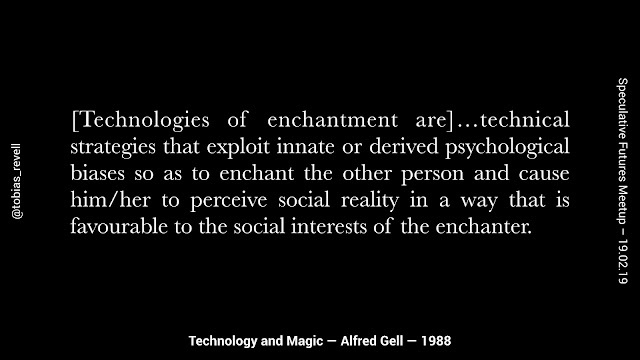 In this individualistic mindset, responsibility is the burden of the individual, given under the premise of ‘autonomy.’ This has the effect of atomising collective or social responsibility into information-rich individual bubbles where it’s imperative on the individual to improve themselves at the behest of the organisations making technology. Think of basically every app ever made. 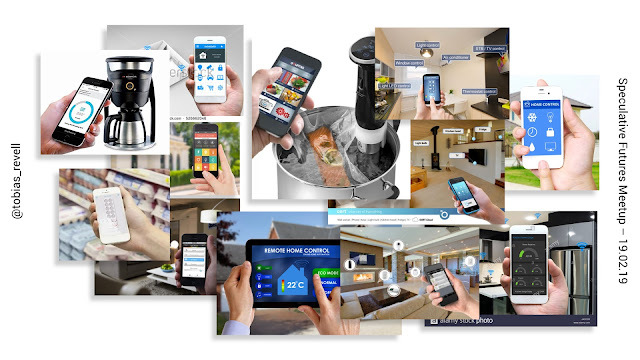 Every app geared toward ‘improvement’ is about changing the lifestyle of the individual in order to conform to the worldview of the organisation producing the app. This precludes a dialogue about why that company are funding climate change denial because, by design, you are at fault for the world’s problems and you need to change. When speculative design is deployed to improve these types of interactions it invariably light-touches on the way the information is delivered or the type of interactions by which it is received. It never attempts to reignite a sense of collective responsibly for change or the spiritual necessity of Earthly survival. 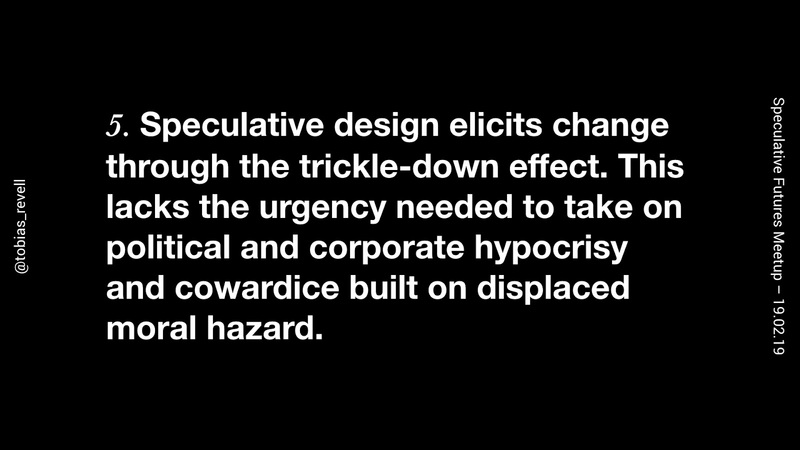 The argument most often used in counter to this idea that, essentially, speculative design is not deployed critically or antagonistically to a point where it has meaningful effect is that of trickle-down. 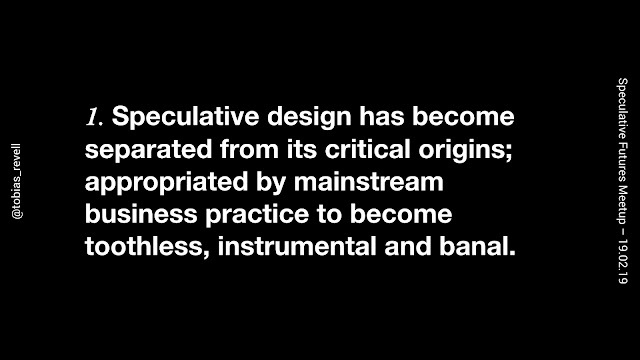 This is the idea that speculative design will influence decision makers and students of design toward more conscientious practices and wider critical consideration. My concern is that this just simply isn’t good enough. We don’t have the time for trickle-down effects or incremental improvement of exploitative organisations. We don't have a good speculative design for planetary-change. The operating model of the business-design pipeline is exploiting the planet at one end and users at the other. The idea that these might in fact be the same thing would mean admitting that an operational focus on individual users and discrete time windows was ineffective design. And large sprawling change over massive time windows and shifting human/non-human interactions does not conform to the way in which revenue is reported. 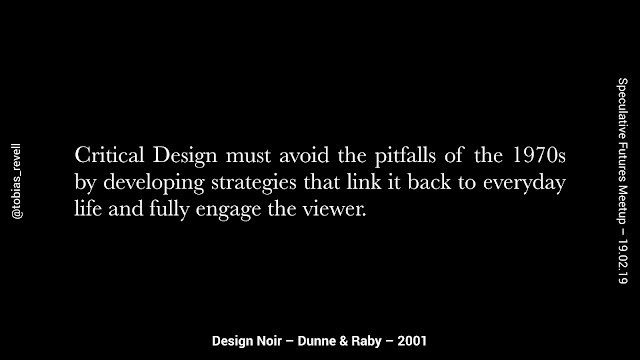 Again, this isn't the fault of speculative design; designers need to eat. 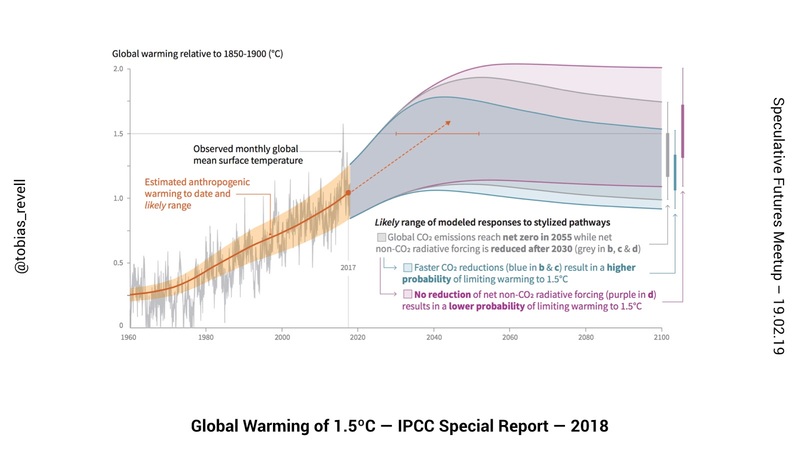 But, under these conditions we can't to look at it as a catch-all solution for planetary collapse. The idea that there is genuine investment in trickle-down, incremental improvement is not justification enough for light-touch or non-critical practice. 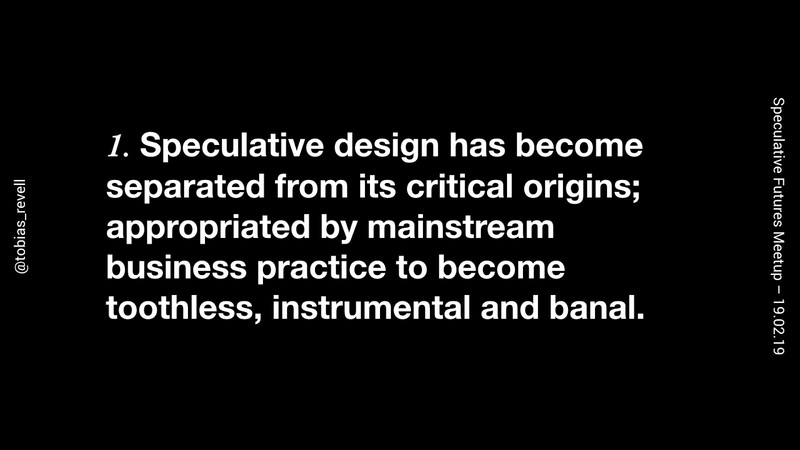 And speculative design is toothless as long as the ultra-rich and leading organisations secure themselves against what they admit is an almost inevitable climate and social collapse. 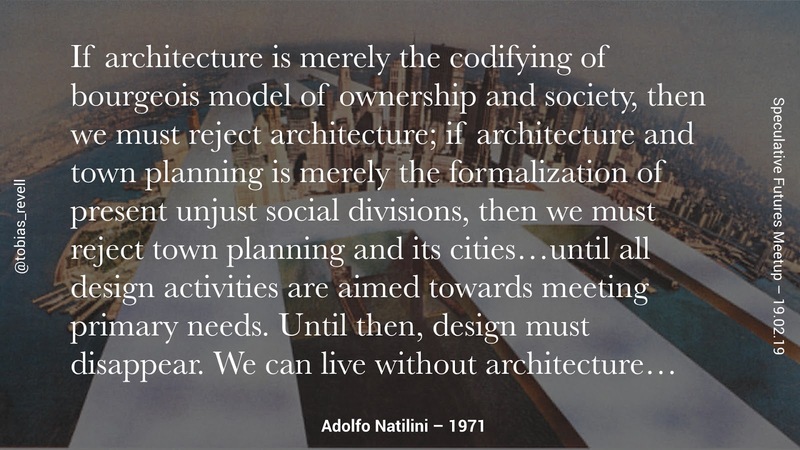 There is no more a genuine investment in incremental improvement through design than there is through legislation. Speculative design has failed to achieve the meaningful tools for change that we once hoped for and has instead been co-opted as a white-washing exercise for tech companies who fund climate change denial and buy high-altitude property to escape rising sea levels. I'm away next week so no blog from me unless it's a terrible week and I am so bored that I want to brave blogger's mobile interface. Ha! no.